Sample five different Philly cheesesteaks as you tour South Philadelphia by Segway, stopping at the best cheesesteak shops along the way! Glide through the streets of Chinatown, Society Hill and South Philadelphia along a five-mile loop past neighborhood highlights, including the Italian Market, South Street and Bella Vista — all without breaking a sweat. On your 2-hour tour, you’ll be introduced to the famed sandwich and the lively vendors who make them. This small-group Segway tour is limited to 7 people per guide, ensuring personalized attention. Meet your guide and begin your tour with a 30-minute orientation session. 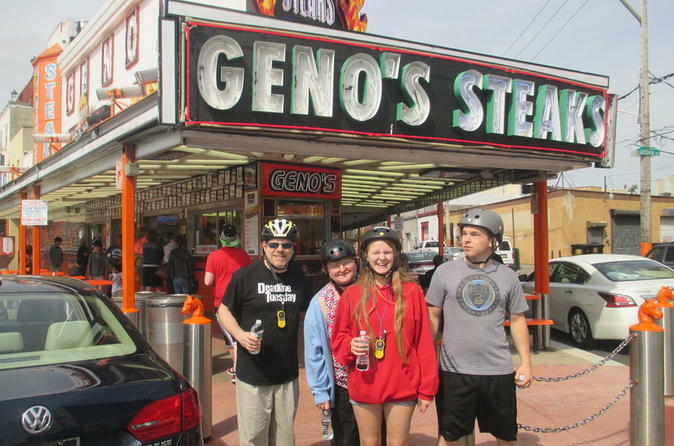 Once you feel comfortable riding your self-balancing electric Segway, weave through the streets of South Philly, stopping at five famous cheesesteak shops on a five-mile loop. As you enjoy these scrumptious tastings of the sandwich that made the city famous, you’ll understand why there’s nothing quite like a crusty roll filled with thinly sliced sautéed beef and melted cheese! Follow your guide through Philly neighborhoods such as Chinatown, the Italian Market, South Street and Society Hill as you take in the historical sights. Along the way, stop at five authentic Philly cheesesteak shops, where you’ll sample five different cheese steaks and determine which kind is your favorite – ordered with or without toppings. Gobble up one quarter of a sandwich at each vendor, from your classic hole-in-the-wall restaurant to the take-out window. Enjoy the flavors and textures of ribeye beef and melted cheese, dripping with toppings such as sautéed mushrooms, ketchup and hot or sweet peppers. Your guide will make sure you order the traditional Philly Cheese Steak, known in Philly as ‘whiz wit’ – meaning Cheez Whiz (processed cheese spread) and fried onions. Delicious!